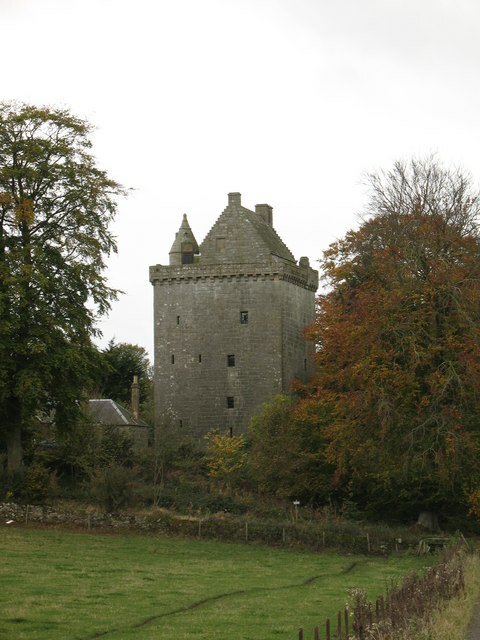 Notes: Scotstarvit Tower is a tower house in Fife, Scotland. It is situated 2 miles (3.2 km) south of Cupar, between Tarvit Hill and Walton Hill, south of the River Eden, near the A916 road. The six-storey L-plan tower, still largely intact, was built in the third quarter of the 16th century by the Inglis family. It was bought, in 1611, by Sir John Scot, author of the satirical The Staggering State of the Scots' Statesmen. Scot rebuilt the tower in the 1620s. Scotstarvit later passed to the Wemyss family, and in 1948 it was given to the National Trust for Scotland, and it is now in the care of Historic Scotland. The castle is a Scheduled Ancient Monument, and a category A listed building.